Bessie Culpepper, Sister-in-Law, F, Jun ----, 15, S, GA/GA/GA. "Marriage and Death Notices" transcribed from The Thomasville Times, Thomasville, GA and published in Origins, March 2011, Volume 21, Number 1, page 9, by the Thomasville Genealogical, History & Fine Arts Library. 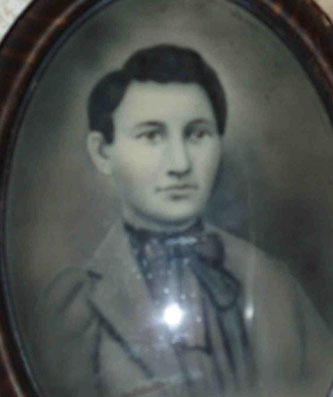 William C. Culpepper, Boarder, M, 1872 (28), Sng, GA/GA/GA, School Teacher. Lamar Culpepper, Son, M, 7/12, S, GA/GA/GA. Mac Culpepper, Son, M, 8/12, S, GA/GA/GA. William C. Culpepper, Cert 47628, Volusia Co., FL, White, 15 Aug 1915 - 2 Apr 1998. Phil Larry Culpepper, Cert 114463, Volusia Co., FL, White, 25 Sep 1922 - 1 Oct 1995. Phil Culpepper 13, Wh, M, Son, GA, In school. Malcolm S Culpepper, inducted from Florida, Staff Sergeant in the 327th Bomber Squadron 92nd Bomber, was awarded the Purple Heart Medal, died 9 Oct 1942 and is honored by a monument at Normandy, France. W. C. Culpepper, Volusia Co., FL, Male, White, Vol 1028, Cert 2171, died 1943. Dora H. Culpepper and W. R. Lunsford on 22 May 1898 in Thomas Co., GA.
J. H. Culpepper and Nancy Haddock on 6 Nov 1901 in Thomas Co., GA, Book N-487. Bessie Culpepper and Joseph White on 20 Nov 1901 in Thomas Co., GA.
Nancy Cornelia Barwick m. \\MYRICK. Philip E. Culpepper, Son, 2, GA, GA, GA.
Ambrose J Culpepper, White, Married, born 1921 in Georgia, residing in Richmond Co., Georgia, enlisted as a Private in the US Army on 23 Feb 1943 in Fort McPherson, Georgia. Find A Grave Memorial# 175579921. Edward B. Culpepper, d. 13 Apr 1957 at 72 years in Richmond Co., GA; Res. in Richmond Co., GA, 09656. Georgia C. Irby, died 02 Sep 1967 at 79 years in Richmond Co., GA; Residence in Richmond Co., GA.
Obituary* say 21 Sep 2016� San Francisco, Calif. - F.J. Culpepper , 92, entered into rest on Tuesday, September 20. Born in Echols County, Georgia, he served in the Navy during WWII and played football for UGA where he earned the nickname, "Cotton Express." William R. Culpepper, d. 20 Feb 1973 at 19 years in Richmond Co., GA; Res. in Richmond Co., GA.
13 Nov 1980, Death Notice for john Richard Culpepper, s/o of M/M Flavius J. Culpepper. He died 11 Nov 1980 in Milledgeville, GA and was survived by his parents and one sister: Deborah A. Watkins of Las Vegas. Interment in Hillcrest Memorial Park. 21 Feb 1973, Page 3D. Death Notice for William Randall Culpepper, s/o of M/M Flavius J. Culpepper. He died 19 Feb 1973 in Augusta and was interred in Hillcrest Memorial Park. John R. Culpepper, d. 11 Nov 1980 at 25 years in Baldwin Co., GA; Res. in Richmond Co., GA.
Doris B. Culpepper (White), d. 11 Jun 1993 at 69 years in Richmond Co., GA; Res. in Richmond Co., GA, Certificate# 025128. E-mail written 26 Nov 2011 to Warren L. Culpepper from Michael Harold 'Mike' McMahan (s/o #3916), Marietta, GA, e-mail address. 9 Nov 1956, page 3C. Birth Announcement by M/M Phillip E. Culpepper of Cynthia Ann Culpepper, 2 Nov 1956 at University Hospital, Augusta. Mrs. Culpepper is the former Ruth Wilcher. David S. Culpepper, d. 23 Jul 1994 at 61 years in Richmond Co., GA; Res. in Richmond Co., GA, 032389. Obituary* 7 Sep 1910� MRS. CULPEPPER DIED TUESDAY AFTERNOON: Funeral Takes Place This Afternoon At Four O'clock at Residence. Mrs. Elizabeth CULPEPPER died at the residence of her son, Mr. Jesse CULPEPPER, 1006 Fourteenth street, at 6:35 o'clock Tuesday afternoon, after an illness of about twelve weeks. Mrs. CULPEPPER was 61 years of age and is survived by two sons, Messrs. Jessie and Robert CULPEPPER, both of Columbus; three brothers, Mrs. Harmon HOWARD, of Lee county, Alabama, and Messrs. John and Thomas HOWARD, of Chambers county, Alabama; two sisters, Mrs. S. A. MARTIN, of Columbus, and Mrs. Amelia OUSLEY, of Lee county, Alabama. She was a member of the Rose Hill Baptist church and lived a noble Christian life. Lizzie Culpepper, Mother, F, 60, Wid, ch 7/2, AL/SC/AL. Obituary of Elizabeth Howard Culpepper (#3921), published 7 Sep 1910. Mattie Avyline Culpepper, Cert 129038, Clay Co., FL, White, 21 May 1923 - 02 Nov 1995. Silas Marcus Culpepper, Cert 36635, Clay Co., FL, White, 14 Aug 1916 - 06 Apr 1985. E-mail written Apr 2006 to Warren Culpepper from Joyce Nowell, e-mail address. E-mail written Dec 2006 to Warren Culpepper from R. M. Sinclair, e-mail address. Harold P. Culpepper, Jr., CPA, CVA. From Shirley Brook: 'I talked with my Aunt Carey C. Manire. Another sad death has visited Orange and another young matron has been called to her reward from earthly cares to a home of peace and rest above. Mrs. Eula Culpepper, wife of Mr. W E Culpepper, died at the family home in this city, Wednesday morning at 4 o'clock after a lingering illness of several months, at the age of 39, leaving a family of seven children, some of whom are quite young and needful of a mother's loving care. Mrs. Culpepper was born in Florida in 1865, where she grew up, and from there moved with her parents to Scranton, MS, where she was married, and from which place she removed with her husband to Orange some two years ago. Her health did not admit to her getting out much and she consequently made but few aquaintances in her new home; but those who knew her pronounce her of a most lovable disposition. She was a member of the Baptist church.